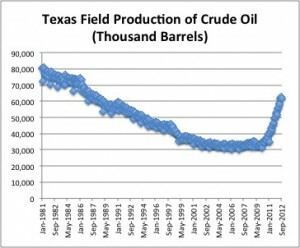 Texas oil production eclipsed 2,050,000 b/d in September of 2012. That's more than the state has produced in almost 25 years! It's no small feat. Production growth has been fleeting for more than a decade. The Permian Basin and the Eagle Ford account for almost all of the state's growth. Since September of 2008, production has grown from 31,661,000 barrels per month to 61,500,000 barrels in September 2012. I'll spare the science, that's almost double. Oil prices recovered relatively quickly after the recession began in 2008 and exploration and production companies began shifting their focus to crude around the same time. If anyone said Texas would double oil production in four years in 2008, he or she would have been laughed off the stage. Fast forward to today and the question is more like - Will Texas double production again? It's great for Texas and it's great for the U.S. Production declines have reversed across the country. The U.S. produced almost 6.5 million b/d in September, the highest level in almost 15 years. You have to go back to September 1997 to find comparable figures. The low was September 2008 when the U.S. produced just under 4 million b/d. Production is up 62% since. Where it goes from here is largely dependent on commodity prices. The resource is there (e.g. Permian, Eagle Ford, Bakken, Offshore), but the question will shift to economics if oil prices were to fall considerably.